Being a Volunteer Performer in all four London 2012 Ceremonies has been good for me. Not only have I gotten to see these historical events in their entirety, live and in person while interacting with the audience, but I’ve also met lots of wonderful people from across the UK and globe — some of whom will be lifelong friends. My involvement has also been good as it has helped to keep my spirits up. How so? Well while I have not mentioned it before, this has been a particularly difficult summer for me professionally. You see my client who convinced me nearly two years ago to give up my freelance marketing consultancy practice and go in-house to head up their digital marketing strategy went into administration at the end of April. So I’ve gone through all the stages of grief. Heck, every time I think I’ve reached the acceptance stage; I go back to the start of the process – especially when an opportunity I’m keen on doesn’t pan out. Or when I take a look at the Internet site one of the Directors has launched using all of the content I spent months securing and editing – heck even rewriting since English was not the native language for many of the clients from the former site. It pains me as I gave up so many nights and weekend all with a view that it would be worth it in the end. Anyway, it been great to step away from the pressures of trying to find the next right opportunity – if only momentarily – by attending evening and weekend rehearsals. And as we get closer to the closing ceremony for the Paralympics on Sunday, I’m trying to soak up as much as possible. With that, I plan to attend the Athletics on Thursday and Women’s Wheelchair Basketball on Friday; both are evening events. I’ve also have costume fitting and rehearsals on Friday afternoon. But the great thing is that the end for me isn’t Sunday night when the Paralympics cauldron gets extinguished at Olympic Stadium. 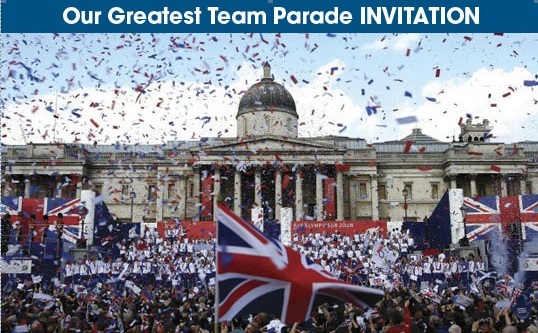 You see earlier today I got an invitation to be in the ticketed volunteer spectator area along the Mall for TEAM GB’s Greatest Team Parade on Monday, 10th September. I am beyond thrilled and honoured as only 1850 tickets were made available in a lottery to the 10,000+ ceremonies volunteers across the four ceremonies. Another 12,000 tickets were made available to the GameMakers, military personnel, emergency services and schoolchildren all representing the other 70,000 volunteers who helped make London 2012 happen. That being said, in addition to us the volunteers who I’m sure will mostly come in costumes/uniforms, the star attraction will be the 800 Team GB and ParalympicsGB athletes travelling on 21 floats, organised by sport and with medal winners across the length of the parade. So can’t wait! It’s all been so fabulous and I thank the lord for taking me on this whole journey. I also thank the London Mayor Boris Johnson who put the original idea into my head. And of course, the athletes who have all risen to the challenge. Finally, fellow Volunteer Performers and Staff for London 2012 Ceremonies Ltd who have made the experience out of this world.